It seems unlikely that a decommissioned aircraft carrier like the USS Midway would be one of the top things to do in a major California city like San Diego, but that's what it is. It's more than just the ship's history that draws visitors, even though the Midway served the United States longer than any other aircraft carrier in history. It's not just that it was the largest ship in the world when it was commissioned in 1945, either. In fact, the Midway appeals to people of all ages and backgrounds as much as it does to history nerds and military buffs. Here's why: the Midway was retired in 1991 and now serves her final tour of duty in San Diego, home to one-third of the Pacific Fleet and many former Midway crew members. They bring the old ship to life as its volunteer docents, giving live talks about what happens on a working aircraft carrier. The Midway is docked at the Navy Pier, between the cruise ship terminal and Seaport Village at 910 N. Harbor Drive. The San Diego Trolley stops three blocks from USS Midway at the Santa Fe Train Depot. If you drive, limited parking is available on the pier next to the USS Midway. If you're in an RV that's more than 18 feet long, the nearest parking is in metered spots on Pacific Highway, one block east of Harbor Drive. Metered parking is also available along N. Harbor Drive and Pacific Highway. The meters are cheaper than the lots, but they have a three-hour limit. When you're in town, you can't miss the Midway, one of San Diego's top attractions. You can even observe it on an iconic San Diego harbor cruise. 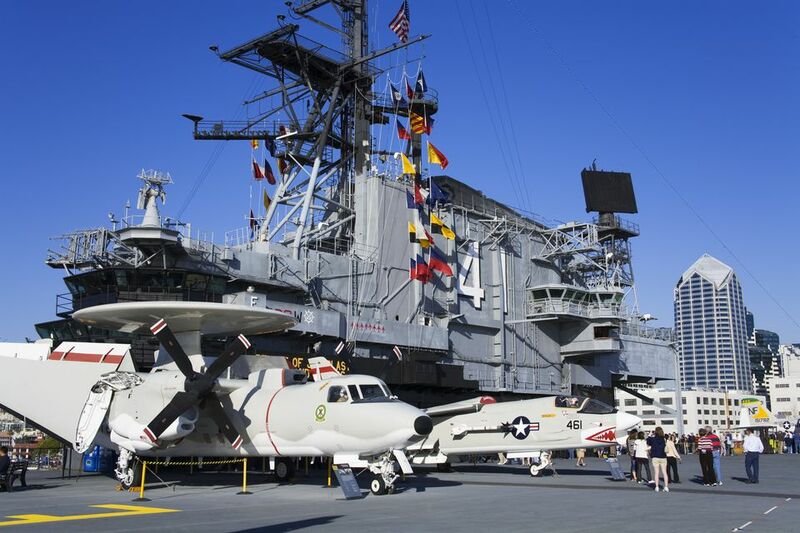 Once aboard the USS Midway, you can learn about life on a Navy ship. You'll find out how airplanes land and take off from a ship moving at 60 miles per hour, riding the ocean waves. Start by watching the short film about the Battle of Midway in the theater. It's included in the price of admission and is a wonderful way to learn about the ship. The self-guided USS Midway audio tour, included in the entrance fee, takes you to the mess deck, sleeping quarters, hangar deck, and flight deck. It incorporates the voices of many who served on the USS Midway, who tell the stories of their experiences there. Volunteer tour guides take you through the bridge, chart room, and primary flight control. It's one of the most fun things to do and lines can grow long on a busy day. You can also live out your dream of flying in one of the ship's Flight Simulators (for an additional charge). There's no air conditioning, so bring water. Otherwise, all those stairs and tight quarters will leave you thirsty in the middle of the tour. Allow at least three hours to see everything on the USS Midway. If you're in a hurry, take the Express Tour. To avoid getting stuck in line for the guided portions of the tour, get there as soon as the USS Midway opens and go straight upstairs. Many doorways have a high threshold, and there are many stairs, some of them quite steep. Comfortable shoes with soles will give you firm footing. If you don't like confined spaces, be glad you weren't stationed on the Midway. The barracks can feel very claustrophobic, and you might want to bypass that part of the tour. Bring a light jacket; it can be windy on the Flight Deck. Leave the big bags behind. Only modest-sized diaper bags and camera bags are allowed. If you have a child in a stroller, you will either have to take them out and park the stroller at the entrance or skip seeing some parts of the ship. The USS Midway is a 100% non-smoking ship. You might end up staying longer than you expected on the Midway. If you need nourishment to continue, you can get something to eat at the Fantail Cafe.